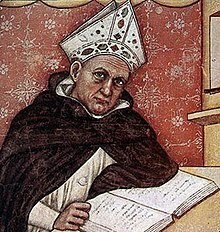 Albertus Magnus, O.P. (afore 1200 – November 15, 1280), an aa kent as Albert the Great an Albert o Cologne, is a Catholic saunt. He wis a German Dominican friar an a Catholic bishop. He wis kent during his lifetime as doctor universalis an doctor expertus an, late in his life, the term magnus wis appendit tae his name. Scholars sic as James A. Weisheipl an Joachim R. Söder hae referred tae him as the greatest German filosofer an theologian o the Middle Ages. The Catholic Kirk honours him as a Doctor o the Kirk, ane o anly 36 sae honoured. ↑ Joachim R. Söder, "Albert der Grosse – ein staunen- erregendes Wunder,” Wort und Antwort 41 (2000): 145; J.A. Weisheipl, "Albertus Magnus,” Joseph Strayer ed., Dictionary of the Middle Ages 1 (New York: Scribner, 1982) 129. This page wis last eeditit on 29 Mey 2018, at 21:46.